This entry was posted on Friday, December 25th, 2015 by Frances Ryan. Hello and merry Christmas to you all! As I mentioned the other day, I am spending my Christmas (mostly) alone—but I am doing so with new and old traditions to keep me company! The day began with a bit of company as I exchanged Christmas presents with my landlord and housemate. (I got jelly beans. Yay! But I didn’t get a wee Westie. Boo!) We then went on a short walk to a geocache before he left for his job as a taxi driver—leaving me to get on with my Christmas lounging. And that brings me to my (mostly new*) Christmas traditions: New pyjamas, lots of food and prosecco, and some great Christmas movies and television specials—enjoyed in front of a roaring fire**. There has been a little bit of PhDing this year, too, as I have a lot of work to do if I want to be Doctor Ryan one day. So whilst my Christmas has been a mostly selfie one (in my new #elfie jammies), it’s been a good one. I’ll be out tomorrow to enjoy some Boxing Day sales and a wee party at a friend’s house. And in fact, I have plans for the following few days, too! 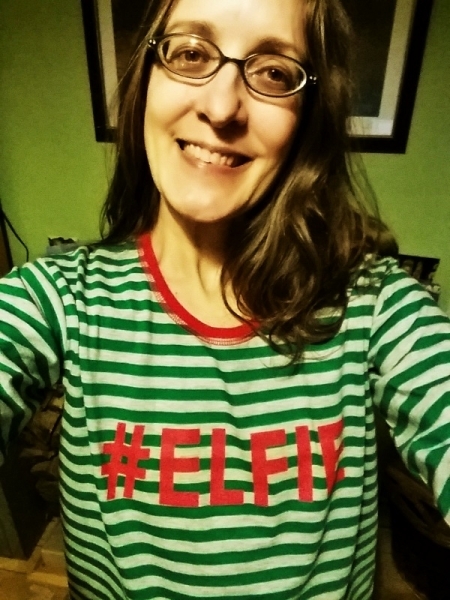 Then it will be back to my #elfie jammies and the fireplace for New Year’s Eve. I hope that everyone has had a lovely Christmas and that the joy of Christ’s birth lives within your heart and soul all year long! ** Special thanks to my landlord who stocked up the firewood (which he chopped) and set the fire so that I only needed to light a match. bug and Schrodie got a new catnip toy. they need to play a lot-esp Schrodie, as she has turned into a Buddah Belly. We love them to pieces. And you, my dear, lots of love being sent your way too. I hope the new year brings pleasant surprises your way. A (late) merry Christmas to you, too! I’m battling a cold at the moment, but am hoping that it doesn’t ruin a fantastic start to the New Year! I hope you’re well and I look forward to seeing you in 2016!